New 2018! San Rocco, beautifully finished, own pool, mountain views, WIFI ! Property 2: New 2018! San Rocco, beautifully finished, own pool, mountain views, WIFI ! Property 16: Magnificent villa overlooking the coast. Garden and terrace. Property 24: "DIVINE OF THE ULIVI"
Property 27: 5 bedrooms, private pool , mountain views, WIFI, walk to bar and shop. Beautiful village house, pool. Walk to restaurant. WIFI. Flexible changeover. Property 28: Beautiful village house, pool. Walk to restaurant. WIFI. Flexible changeover. Typical Tuscan Farmhouse, Superb View on Lucca, private garden/parking.WIFI. Property 29: Typical Tuscan Farmhouse, Superb View on Lucca, private garden/parking.WIFI. Tuscan villa with private pool, large garden & Wi-Fi. Property 38: Tuscan villa with private pool, large garden & Wi-Fi. Beautifully restored Farmhouse, private pool, great for groups wanting privacy! Property 43: Beautifully restored Farmhouse, private pool, great for groups wanting privacy! Charming newly renovated cottage great view, own pool, walk to bar/shop. WIFI! Property 47: Charming newly renovated cottage great view, own pool, walk to bar/shop. WIFI! 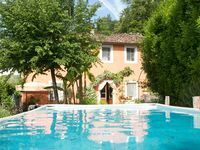 Totally private cottage with own pool, amazing views and close to Barga! Property 49: Totally private cottage with own pool, amazing views and close to Barga! The villa was precious and the view was amazing. However, getting there was quite scary! And the amenities were scarce. But the owners were delightful and gave us a bottle of wine and delicious cookies! I don't think I'd stay there again because of the scary drive.